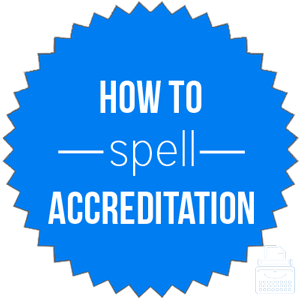 Spelling of Accreditation: Accreditation is spelled a-c-c-r-e-d-i-t-a-t-i-o-n. It is formed by adding the suffix –ation to the word accredit. Definition of Accreditation: Accreditation is the act of accrediting or the state of being accredited. Being accredited means being certified or approved as having met certain requirements. An accreditation is a sort of recognition, status, or certification that an organization or institution receives upon meeting certain requirements. Typically, an accreditation entitles such an institution or organization to certain advantages and a more prestigious reputation. Pronunciation of Accreditation: Accreditation is pronounced a-kred-i-tay-shun. It is a five syllable word. What does accreditation mean? Accreditation is a noun. It is the process of becoming or the state of having been accredited. To become accredited, or receive accreditation, an institution or organization must demonstrate that it has met specific requirements as governed and approved by an official review board. After meeting certain health and wellness requirements, the Health & Safety department of the Canadian Red Cross received its accreditation and a plaque stating so. Our association only provides accreditation to schools that meet high standards. To form the adjective, accreditable, the suffix “-able” is added to accredit. Accreditable describes an institution or organization that is worthy or able to be accredited. The board visited our offices and said that we will be accreditable as soon as we meet these last few requirements. The first known use of accreditation was in 1535, according to Merriam-Webster’s. The word accreditation was formed by adding “-ation” to the verb accredit. The word accredit was likely borrowed from Latin’s accreditus, which is the past participle of accredere, meaning to give credence to, believe, put faith in. The Latin verb accredere comes from “ad-” + credere, to entrust, believe. Accreditation is a noun referring to the process of becoming accredited by meeting certain, approved standards and requirements. This noun form is formed by adding “-ation” to the verb accredit.